In the US, there are 2 credit card equipment manufacturers that basically own the entire terminal market, Verifone and Hypercom. Lipman USA is another major player however, Verifone purchased Lipman several years ago effectively creating 2 major brands. Another major company Ingenico, has a larger global presence, but their usage in the US in minimal at least in the independent sales markets. A few years ago a new terminal company named Dejavoo was established. Dejavoo was founded by the original founder of Lipman USA, and seems to be founded on the same principles that Lipman was: rock-solid products that are easy to use and very reliable. In my opinion Lipman’s Nurit 2085 is the most reliable and best land-line terminal to date. It isn’t very small, and it doesn’t look particularly classy, but it works well, it’s cheap, and it’s easy to use. Having watched the reliability of credit card terminals diminish over the past 10 years, I would love to see a highly-reliable brand emerge. Since the terminal market is monopolized by a few behemoths, it’s equally good to see a new competitor with a strong history of success in this specific industry. Dejavoo currently offers several terminals which should meet the requirements of most merchants, whether retail or mobile. One of the coolest things about the Dejavoo terminals, is that they all (except the C5 and M3) support a USB WiFi adapter, allowing a merchant with a secure WiFi network to eliminate an extra cord on their counter-top. All Dejavoo terminals have quick thermal printers, and have internal PINpads. Dejavoo terminals meet the newer PCI-PED requirements for PINpads. Lastly, all Dejavoo terminals are at the lower end, if not the lowest, of cost for comparable terminals from other manufacturers. Dejavoo C5 – The C5 is the entry level terminal from Dejavoo. It is dial only, and does not support USB components like the X series. It is the lowest cost terminal from Dejavoo. It is PCI certified and would be a comparable replacement for Nurit 2085, Hypercom T7 Plus, and similar products. The C5 looks to be the most durable of the Dejavoo terminals, and is slightly larger than the X or M lines. Most merchants will probably want the additional features of the X line, as the entry X5 terminal is a significant improvement to the C5 without a significant price increase. Dejavoo X5 – The X5 is the first terminal in the X-line. It uses a custom Linux operating system, dual processors, and supports USB peripherals including the USB WiFi adapter. It features a compact, well styled design, and supports a multitude of features all for a low price. It is a dial-only terminal, but has more memory than current Verifone or Hypercom terminals. 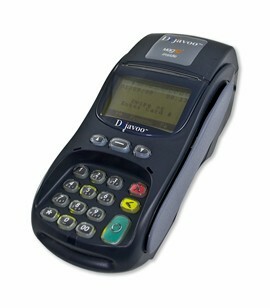 It is PCI compliant, and features a smart card reader and internal PINpad. Dejavoo X8 – The X8 is almost the same as the X5 except that it supports processing over an 10/100 IP/Ethernet connection in addition to a dial-connection, and has an additional USB port. It is currently the lowest cost Ethernet terminal that we know of, just edging out the Hypercom T4220. The Dejavoo M series, are PCI certified, GPRS, wireless terminals. They are all based on the same M3 platform. The M5 has a base which includes a charging station. The M8 includes a base with an Ethernet port. The M5 and the M8 support the WiFi module, but the M3 does not. The GPRS wireless network is normally used with ATT Wireless and is currently the most used network for credit card processing. So far I have not heard of development on the CDMA networks which would include Verizon and Sprint, but I imagine that there are plans in the future. The M series terminals all include internal PINpads and thermal printers. They are compact, and use the same dual-processor system as the X terminals. 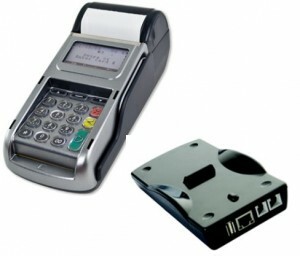 Like X terminals, M series terminals accept normal credit cards as well as smart cards. The M series terminals aren’t the most elegant terminals out there, but it looks like Dejavoo traded fashion for a more robust and durable platform, which is far more important for wireless terminals. The Dejavoo WiFi module is an inexpensive USB WiFi stick that allows most Dejavoo terminals to process on a secure WiFi network. It theoretically works with the M3, M5, X5 and X8 terminals (We’ve personally only tested it with the X8, but Dejavoo has assured us that it works with the rest). We’ve been playing with one for the past week and despite some minor issues in initially getting the connection to work, it seems like this is the best only WiFi processing option available. The Verifone VX 610 is completely unusable because it’s support for WPA security is horrendous. The VX 670 is equally bad because it requires an expensive base, pushing the price above $800. A note on wireless security and processing – WEP security is completely prohibited by PCI so do not under any circumstance use WEP or a non-secure connection to process using WiFi. Businesses should use WPA or WPA2 preferable and use a strong password like “4p%n&1GiJF$*nK8n”. Based on our initial experience with Dejavoo terminals, they look to be the most promising brand of terminals we’ve seen in a long time, especially with regard to their wireless M-series wireless terminals. Several processors have made Dejavoo their preferred brand. I would like to see their performance over the next year or two before making a commitment. In any case, if I were Verifone or Hypercom, I would probably be concerned. The Dejavoo terminals appear to be superior to both brands in just about every way including price, and only time will tell if they live up to their founder’s reputation. Protection from fraud is also a key to choosing the right credit card processing terminal.